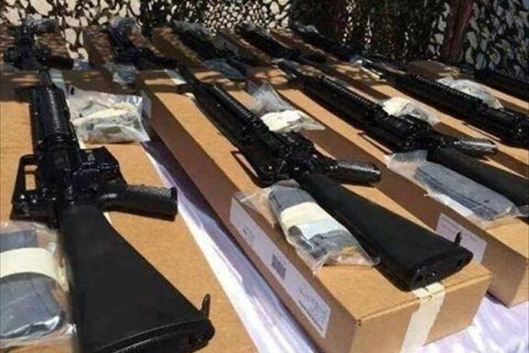 (FNA) ~ The Iraqi army and volunteer forces discovered US-made military hardware and ammunition in terrorists’ positions and trenches during their mop-up operations in the Northern parts of the town of Beiji. The Iraqi forces found a huge volume of military equipment and ammunition from ISIL’s hideouts in Beiji, Northern Iraq. « The military hardware and weapons had been airdropped by the US-led warplanes and choppers for the ISIL in the nearby areas of Beiji, » military sources told FNA. The Iraqi forces started operations to purge Beiji of terrorists few months ago, and later took full control of the city, its refinery and its surrounding areas. But in early September reports said that the Takfiri terrorists took back some parts of Beiji after two weeks of heavy attacks on the region.